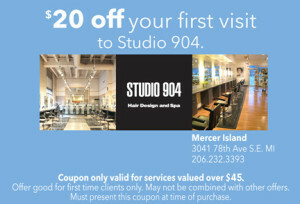 Conveniently located on Mercer Island, Studio 904 offers a wide range of hair services including haircuts, stunning hair color and custom foils in a friendly, elegant setting. I've been a client for close to 16 years and never once had a bad experience. They always do a top notch job, and make me look & feel like a million bucks. I love this place! I have been going to Studio 904 for years and years. Started when they had a salon in pioneer square. I have tried other places off and on but always return. The stylists are nice and friendly. They work as a team which is nice too. They do not disappoint. Highlights were great! I love this salon! There has not been one stylist that has given me a bad haircut or missed my vision! I really do mean it when I say that I trust this salon. I am completely comfortable walking in and getting any stylist they can offer. I have been going to Studio 904 for at least 8 years now and have always had the best service ever!...Their customer service is outstanding!..My hair has always been extremely stubborn with the highlights and it takes a long time to get the perfect color, but Studio 904 always does it perfect!...and if anything is not the way you like it...they go above and beyond to help you achieve the color and style that YOU want! !...The team has been consistently friendly and helpful with suggestions for your type of hair and what will work best for you!..All of the stylists help each other on different clients to ensure everyone is taken care of! Studio 904 is conveniently located at 3041 78th Ave SE, on Mercer Island (in the same parking lot as Rite-Aid and directly across the street from the Mercer Island Post Office). Please call (206) 232-3393 for directions or to schedule.